Family Hotel in Umag Istria Croatia. 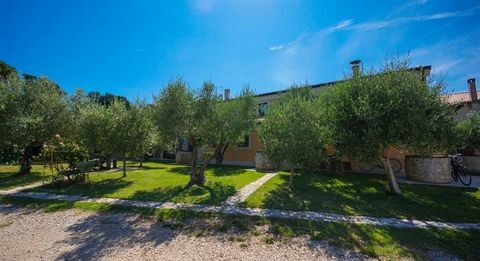 Family Hotel in Umag Istria Croatia A lovely stone house built back in 1704 and completely renovated in 2004 and turned into a family hotel. The house has a rich history, in 1841 started working as the oil mill pursuant to the old methods produce golden olive oil on the principle of molding in an old mill "Torac" which is today part of the tavern, and the oil is then stored in the "oysters "which can be found in the courtyard of this 312 year old property. The house consists of a basement with three rooms, which is a perfect place for making wine cellar for all lovers of good wine, ground floor where there is a tavern with a kitchen where breakfast is served, lunch and dinner, which exudes warmth and family atmosphere. On the ground floor are also three rooms with private bathrooms and one apartment consisting of a bedroom, bathroom and kitchen of approximately 40m2. The first floor also has reserved four rooms with private bathrooms and four-room apartment with total area of 80m2. The house has a beautiful garden which makes it a peaceful green oasis located just 1500 meters from the sea. The property is noteworthy that for all those who appreciate the history and tradition of this cherished family customs and tradition. About the area: Umag is a coastal city in Istria, Croatia. The city hosts a yearly ATP tennis tournament on clay courts. It is the westernmost city of Croatia, and the municipality includes Savudrija/Salvore, the western most point of Croatia. Umag is on Croatia’s Istrian peninsula. The remains of the 10th-century town walls include a gate and a drawbridge. Umag Town Museum, in a former defense tower, contains Roman-era objects such as amphorae and lamps, as well as contemporary local art. Development of 5 Apartments in Split Croatia.